The Mister and I managed to find our dream apartment in the heartland of Melbourne’s brunch mecca, and we’ve been taking full advantage of all of the local cafes since we arrived. I’ve been seeing Joanie Clothing on my Instagram feed for a couple of years ago. 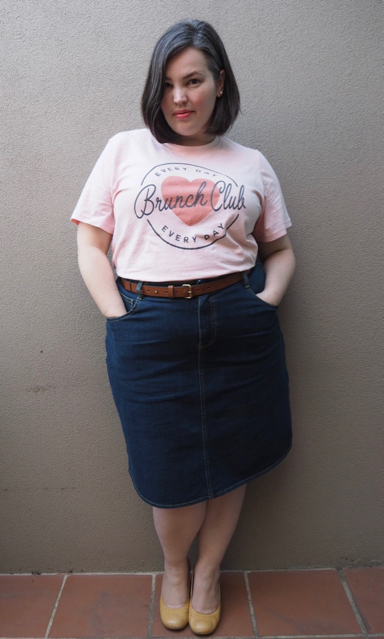 They do the kinds of fabulous retro-style dresses and colourful novelty prints that would have been irresistible to me a couple of years ago, but it’s this Every Day Brunch Club tee that finally had me giving the label a whirl. 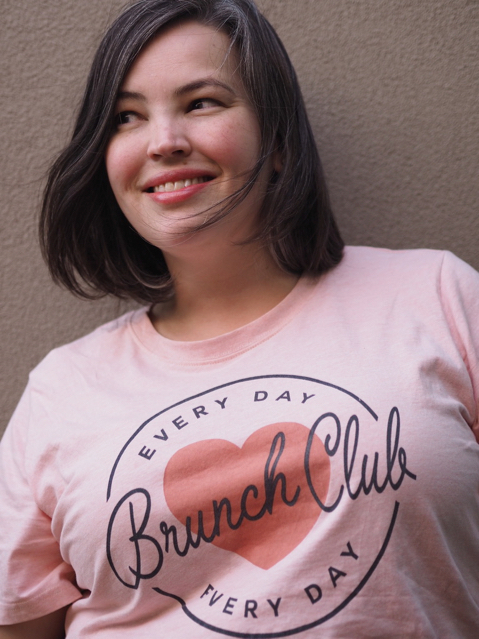 According to Joanie Clothing‘s About Us page, they imagine their customer to be “quietly confident, witty and full of wonder – with an infectious fervour for life’s little pleasures. She wears her heart on her sleeve, is loyal to the end and prides herself on being a great friend.” She’s also anything from a size 8 to a size 26, and the brand’s social media actually backs this up – they use models of all sizes in their campaigns, and on most of their product pages. I ordered both this and a fabulous sweater that you’ll see as soon as the weather starts to cool. (Their slogan jumpers? Looooovve.) and they both fit perfectly, were good quality, arrived quickly, and were nicely packaged. Shipping was a not-too-prohibitive £9. 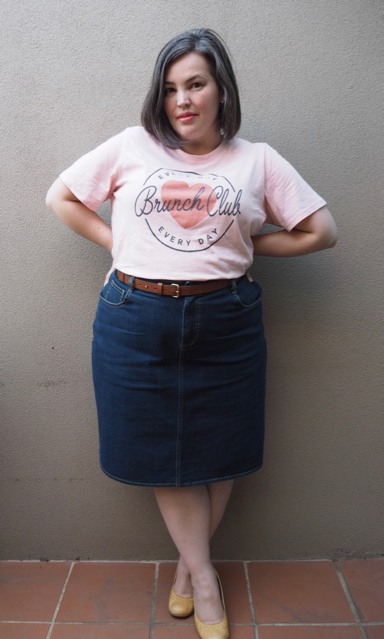 This past weekend (for brunch, naturally) I teamed the tee with a denim skirt that was part of my last eShakti order. I’m not sure if I can express quite how much I’m loving being able to order from eShakti. The store’s new-and-improved order period (my last order took ten days to arrive! For three custom-sized items!) and their regular discount and special offers has meant that my wardrobe is growing in leaps and bounds. 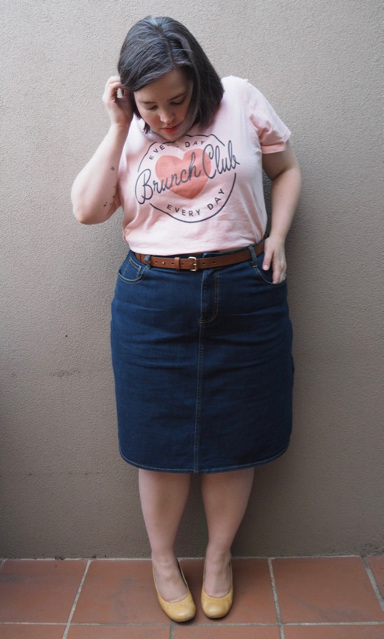 This denim skirt fits like a dream, and the fabric’s better quality than I’d expected. It’s very stretchy, but doesn’t pull across my hips and tummy as I usually find pencil skirts do. I recently took the plunge on a jumpsuit and a fancy new party dress that you might have caught in my Instagram stories (along with some majorly goofy facial expressions), and I’m keen to try their trousers next. This entry was posted in Uncategorized and tagged eshakti, joanie, skirt, warm by lillipilli. Bookmark the permalink. Hi Lily, Love the outfit especially the skirt. I have been stalking e Shakti for some time but haven’t been sure. I like the options to customise (mainly sleeves for the cold Canberra winters). Do you have any tips for a first timer on customising with e Shakti? I always suggest starting with a knit item or one with a bit of stretch, because it’s lot easier to get the sizing correct. If you can, it’s well worth getting it custom-sized to fit your measurements. Definitely check and double check your measurements (especially if you’re ordering something without any stretch), because they’re very precise! I’ve found their cotton poplin items are a bit prone to crushing (but I haven’t tried their stretch poplin, which could be better). Hope this helps!